The other day, I was ruffled by the sweltering summer heat of May and undecided on what to have for lunch. On scanning my Twitter timeline I came to know of GetLunchin.com with it's sponsored tweet flashing in front of me. It promised of fresh homemade lunch delivered to office or home at select locations in Mumbai, each priced at Rs. 269. 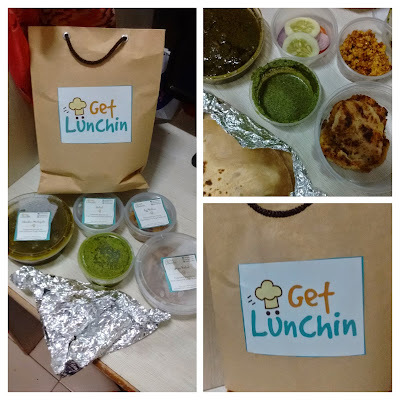 So on that day I decided to order my lunch from GetLunchin.com and check it out myself. Select your menu of choice - Veg/Non-veg. Everyday, they have a different itemised menu under each section. Add a dessert/ beverage. You can also add a TIP. Select mode of payment - Currently they only offer COD. Once you place your order, you get a confirmation email and an SMS. It had 3 Roomali rotis, sliced unseasoned fresh salad, Chicken Haryali gravy, 1 small portion of Egg Halwa and 2 pieces of Soya Kabab. The food was very freshly prepared and tasty. Although skeptical at first, I loved the egg halwa and craved for more. Roomali roti and the Chicken curry was devoured in minutes. The curry was mildly spiced, perfect for a hot day with enough tender and juicy chicken pieces. The soya kebabs were soft and tasted nice too. Pluses: The service is simply superb - prompt and convenient. As promised I received my order well before lunchtime. It is indeed hygienic and tastefully prepared home lunch minus the junk. Plus, it's a nice way to sample other homemade cuisines at the confines of one's home/office. Although it is stated the portion size is ideal for one person, I felt otherwise. Perhaps a rice dish could've made it more filling. Secondly, for Rs. 269 it may perhaps be not economical and VFM for someone to order in daily. Instead of junking it out on the chindian food or burgers, I feel this lunch was a welcome change to my food schedule. Looks interesting I wish I was in Mumbai right now !